The Vintages at Galway Downs comes WITHOUT all the hassles. Simply pack your bags, order your hobo packs and s’more kits and off you go. What will you feel like? Come try for yourself! Adults only. No children under 12 years of age. 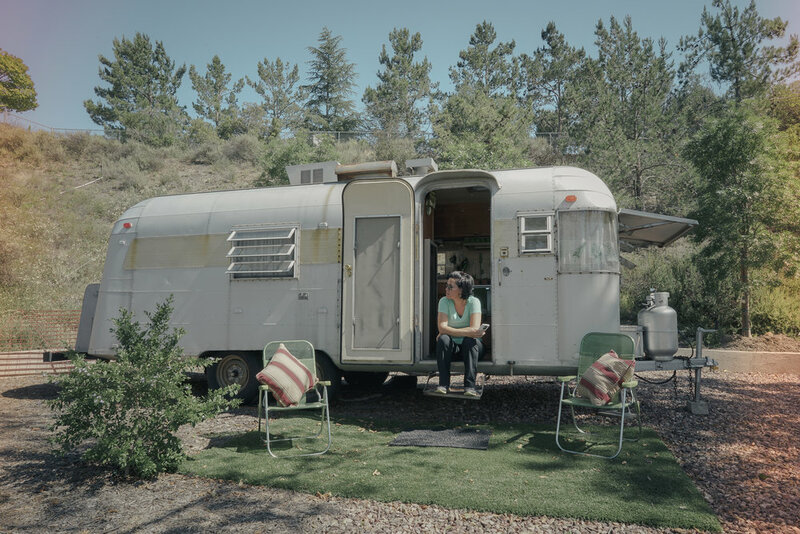 Escape to a unique Vintage trailer Camping experience in one of our vintage Silver Streak travel trailers at Galway Downs. It’s a unique experience unsurpassed…. You’ll be glad you did. It's an easy 5 minute drive to Temecula Valley Wineries and Pechanga Casino. Historic Old Town Temecula is just 10 minutes down the road and has many great restaurants, hip night life, shopping, antiques and even has a farmer’s market on Sunday mornings. Wine Country is just 5 minutes away from your front door. With 45 wineries to choose from … let us know your favorite types of wines and we can direct you to a winery that specializes in your favorites! Red or White? Sweet or Dry? Cabernet, Merlot, Malbec, Syrah, Chardonnay, Pinot Gris or decadent ports with chocolates?? Temecula has them all. The mild chill of the ocean breezes that roll in around the late afternoon and early evening offer the perfect opportunity to enjoy a cozy campfire on the Cowboy Caldron. The Caldron is well suited for grilling, cooking hobo packs, and roasting s'mores for dessert. An ample supply of fire wood is available for purchase. There are shaded areas under majestic eucalyptus trees and plenty of seating around the fire pit. Our vintage Silver Streaks are clean and mostly original inside and out. We've based their names on the color of their original propane stoves. They feature many of the original appliances as well as modern upgrades including: a refrigerator, microwave, kitchen and bath room sinks and shower with hot and cold running water. The trailers all have flush toilets on septic. Our goal is to provide our guests with a unique wine country escape and trackside camping experience. We Are Located in A Rural Equestrian Boarding and Training Facility called Galway downs in Temecula california. This 240 acres ranch is in the heart of Temecula’s Wine Country and has recently expanded its usage to include a Wedding Venues managed by Wedgewood, has one of the finest group of soccer fields, and is a world renouned equestrian training and competition Center. The trailers are set up in their own neighborhood called the Vintage Village next to the race track. You can arise early to view hot air ballons rising over the mountains and view- the race horses as they take their morning training runs. This quiet and relaxing campsite is yours to enjoy while touring the Temecula Valley Wine Country, so please no parties and respect the other trailer campers. Quiet time is from 10 PM to 7 AM.. No additional friends or family will be allowed on the property, no exceptions. Please enjoy our campground to it's fullest & please leave it exactly as you found it. The campsite has ample seating around a hanging fire pit called the Cowboy Cauldron Firewood is available for purchase . Campers are encouraged to utilize the campfire facility but please use common sense. Keep the fire size reasonable. One or two logs maximum make for a nice fire. Do not leave an unattended fire and extinguish any glowing embers before retiring to bed. You don't have to make the bed or pull the sheets, just leave your used towels in the bathroom. Wash any dishes you may have used & please put them away. Please dispose of your trash in the outside trash can. Treat These Timeless Vintage Gems With Care! Our trailers are original 1960's era Silver Streaks… 50 plus year old pieces of American history. Please be very gentle with them. Original parts are very expensive & difficult to find & replace. Please be careful when opening and closing the vents and windows. The gears on the handles can strip easily and are almost impossible to replace if damaged. Absolutely nothing but toilet paper flushed down the toilet! No feminine products or non-biodegradable items. Anything but toilet paper will clog the toilet! Thank you very much! Have a wonderful time At The Vintage at Galway Downs in Temecula LIKE US ON FACEBOOK IF YOU’VE ENJOYED YOUR STAY…. And Thanks For Coming! After booking, you will be contacted via email or phone regarding property access. The property is fenced and gated. A gate code is required to access the property and will be provided once the booking is confirmed. A key holder is attached to the trailer the access code to retrieve the key will be given when booking confirmed.